The Orange County Sanitation District (OCSD) is a wastewater treatment facility that serves Orange County, California. It consists of two operating plants, referred to as Plant No. 1 located in Fountain Valley and Plant No. 2 located in Huntington Beach. It is the third largest wastewater treatment facility west of the Mississippi River. OCSD is responsible for wastewater services for 2.5 million people in Orange County, California. In an effort to streamline the inspection of over 8,000 manholes, OCSD required an accurate, reliable and easy-to-deploy technology solution to automate the manhole inspection process, eliminate paper-based data collection and move to a centralized Geographic Information System (GIS)-based electronic repository for all manhole asset and maintenance records on the sewer network. Like many water and wastewater utilities around the world, OCSD had made a large investment in building an Esri ArcGIS® based GIS to map pipes and assets that are installed throughout its service area. Maintenance is an ongoing task and requires that data about the location of assets and the work performed on these facilities is accurately collected in the field. Trimble Unity helps with this challenge. As an authorized Esri business partner solution, Trimble Unity integrates Esri ArcGIS technology and allows utilities to view and update maps, assign work, manage workflows and collect field data and mapping updates using a variety of mobile devices. When used with a rugged Trimble Juno® T41 or Trimble GeoExplorer® 7 series handheld, workers can more accurately locate and map assets in the field (with up to decimeter accuracy using a Trimble GeoExplorer), helping significantly improve the quality of their critical infrastructure and asset management data. Trimble Unity can also be used with smartphones using iOS and Android. The Orange County Sanitation District (OCSD) implemented Trimble® Unity™ software in combination with Trimble Juno T41™ rugged Android mobile devices for automating utility manhole maintenance, mapping and inspection. 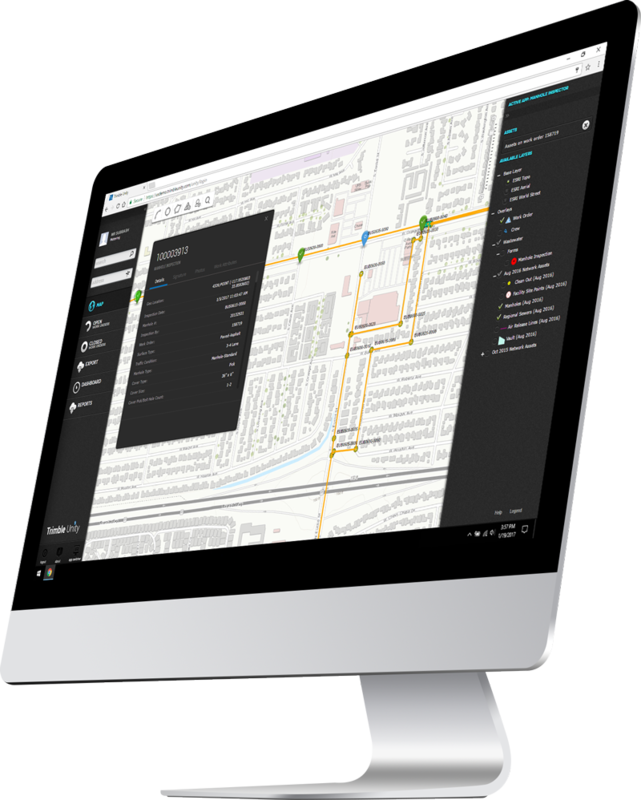 The Trimble Unity software provides a single cloud-based software-as-a-service (SaaS) platform with built-in applications for helping water, wastewater and storm water utilities automate a variety of critical field operations, regulatory compliance and reporting activities.